This website, The Space Lofts . com has been designed to keep all real estate trading needs within one source for 1238 Seymour St. We work as Vancouver loft specailists and The Space is home to many current and future clients. This website has been designed to help find a Space condo to buy or rent, and how to get your condo or loft marketed in front of targeted viewers. Featuring all Space MLS listings, full building photos, information and building updates. Start now at see all property for sale at The Space. Has never been marketed better.Prospective buyers and the loft community will have 24 hr access to all the building information and property for sale. The Space Vancouver is located in the heart of Downtown Vancouver, and near the renowned Yaletown community. This tower features, condos, from small studio's, double level lofts, and large city suites. Marketed by Albrighton Lofts. 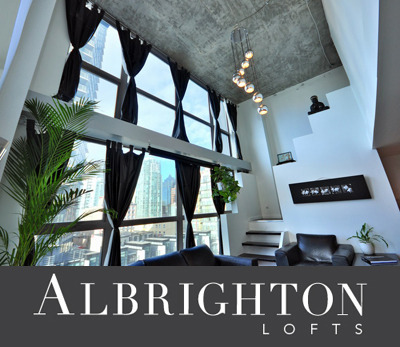 Featuring new Vancouver loft listings updated daily, great architecture, modern condos, local real estate updates, and more. Go to the www.albrighton.ca blog now. More Albrighton targeted buildings: The Grace 499 Drake St, The Grace tower 1280 Richards St, The Qube 1333 W Georgia St, Shangri-la condos 1111 Alberni St, Shangri-la estates 1128 W Georgia St, Metropolis Lofts 1238 Richards St, The Space Lofts 1238 Seymour St. Koret Lofts 55 E Cordova St. Boman Lofts 528 Beatty St. Alda 1275 Hamilton St Tribeca Lofts 988 Richards St McMasters Buliding 1180 Homer St. Waterfall Building 1540 W 2nd Ave XL Lofts 428 W 8th Ave Flatiron 1277 Melville St Harbour Green 2 1139 W Cordova St. The Spot 933 Seymour St. 546 Beatty St. 1178 Hamilton St The Hamiton. Domus Yaletown 1055 Homer St, Greenshields Building 345 Water St, 550 Beatty St. Pure 1252 Hornby St,, 350 E 2nd Ave Main Space. New Yorker 1066 Hamilton St, Cannery Row 2001 Wall St, 1241 Homer St, 1230 Hamilton St Yaletown Loft, Crandall Lofts1072 Hamilton St, 1168 Richards St, Iliad 1245 Homer St, One Wall Centre 938 Nelson St. See the full list at www.albrighton.ca.